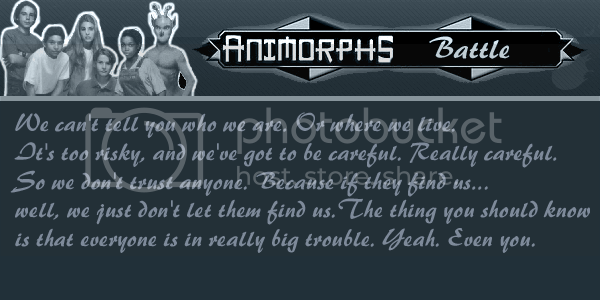 I've recently found another Animorphs RP forum, however on this one pretty much all of the main characters are taken already. Sometimes weird things happen to people. Ask Jake. He may tell you about the night he and his friends saw the strange light in the sky. He may even tell you about what happened when they realized the "light" was only a plane -- from another planet. Here's where Jake's story gets a little weird. He and his friends are told the human race is under attack, but they're given the chance to fight back. The blue box Elfangor used to create the Animorphs has been found by a kid named David. Marco sees David with the box and knows the Animorphs must take it back. They end up saving David and the box from Visser Three, but with the Yeerks still looking for them. They turned David into one of them, Then realized it was a mistake. But it was too late. David has turned on the Animorphs, and has created his own group of Animorphs, but with the name of Altermorphs, simply meaning to change shape. These Altermorphs aren't as nice as the Animorphs would have hoped. The Animorphs decide to take their chances and start creating new Animorphs, hoping to be able to win both battlesSo now it's a battle between the Animorphs, and the Yeerks, and the Animorphs, and the Altermorphs. Will the Animorphs be able to battle the Yeerks once again, in order to stop Visser Three from stealing the box, and killing them? WHOA!! cool! as in totally insane cool! who's taken, who's not? Wow that site sounds so cool. Is it still active? Let me know on AIM, berserkerrage08. Later dudes. HE IS THE ONLY ONE WHO CAN TAKE THE UNITED STATES OF AMERICA AND PUT IT BACK ON TOP!!!!!!!!!!!!!! What would i be if i could morph? A skunk. Small but lethal. I'll take a look at it. I've avoided Animorphs RPs because I felt that (when combined with all the fan fiction I write) they take my nerdiness to an unacceptable level. But if it intrigues me, I'll think about it. Yeah, I know how that feels. I enjoy it though. When you get there look me up. I have two accounts, Ty and Rickytanner. Rickytanner is a temporary thing, and Ty is permanent. On the Chat, though I always use the name Ty. I hope you like it, and I'll be looking for you! Well, I'm there now. I go by David and Machiavelli. The blue box Elfangor used to create the Animorphs has been found by a kid named David. Marco sees David with the box and knows the Animorphs must take it back. They end up saving David and the box from Visser Three, but with the Yeerks still looking for them. They turned David into one of them, Then realized it was a mistake. but with the name of Altermorphs, simply meaning to change shape. These Altermorphs aren't as nice as the Animorphs would have hoped. 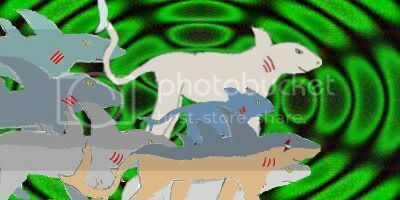 The Animorphs decide to take their chances and start creating new Animorphs, hoping to be able to win both battles. So now it's a battle between the Animorphs, and the Yeerks, and the Animorphs, and the Altermorphs. Will the Animorphs be able to battle the Yeerks once again, in order to stop Visser Three from stealing the box, and killing them? Come on, now, doesn't that sound interesting? And hey, if you be an Altermorph, you get help me carry out evil plans! Here, gio. I think you may need this. capnnerefir wrote: Here, gio. I think you may need this.